The Green Deal Home Improvement Fund is set for a come back, with the energy secretary Ed Davey announcing GDHIF phase 2 at the Liberal Democrat Conference in Glasgow today. It will see a funding pot of £100 million made available to homeowners, giving them a second opportunity to apply for Green Deal cashback for carrying out energy saving improvements. The first phase of GDHIF proved so popular it was suddenly shut down at the end of July after just seven weeks, with applicants swallowing up the initial £120 million funding at an unprecedented rate. Since then homeowners and businesses have been left in limbo land, as the Government set about processing vouchers and auditing the many thousands of applications they received. Obviously it’s great that the Government seems to have listened to the industry’s call to relaunch the cash back incentive. The energy secretery has now confirmed that the Green Deal Home Improvement Fund will indeed be making a much welcomed comeback. Although no date has yet been confirmed, the cash back scheme will reopen before the end of November. It remains to be seen how much money eligible homeowners will be able to apply for. A further announcement about cashback rates, eligible measures and other terms and conditions will be made next month. 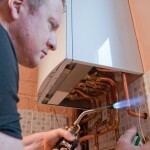 The Green Deal Home Improvement Fund was introduced to raise interest in the Government’s Green Deal, a scheme which gives homeowners the opportunity to carry out energy efficient improvements, such as installing a new boiler replacement, double glazing or solid wall insulation at no upfront cost by taking out Green Deal finance. When the incentive opened in June, homeowners could apply for cashback of up to £7,600, which was then reduced to £5,600 just prior to its closure. Commenting on today’s news, the UK Green Building Council said they welcome its return, although warn that it’s only a “temporary solution”. We’ll bring you more GDHIF news as and when we get it. In the meantime you can read DECC’s official Green Deal press release.